On 24 May 2018, the Home Minister, took stock of the progress of construction of border fencing, roads and outposts along India's borders with neighbouring countries in a high-level meeting and directed all concerned officials to maintain constant vigil and security on the borders. With regard to the Indo-Pakistan border, Home Minister expressed satisfaction that 97% of the sanctioned border fencing work has been completed. He also stressed to utilize the space technology for strengthening the border guarding and policing, and reviewed implementation of pilot projects on Comprehensive Integrated Border Management Systems (CIBMS) on nonphysical barriers. The catalyst for implementing of CIBMS came as a directive from the Punjab and Haryana High Court (after the Pathankot terrorist attack on January 1-2, 2016) that if no decision to protect the India-Pakistan border were taken by February 16, 2016, stern action would be taken against the officials of the MHA. That is how India function in matters of security. Following the Court directive, MHA sanctioned implementation of CIBMS on January 29, 2016 through two pilot projects. The aim of the pilot projects was to test the CIBMS on various parameters like requirement of manpower, user friendliness, technical training, repair and maintenance. The complexity of guarding the Indo-Pak border can be gauged not only because of infiltration for terrorist acts but also narcotics smuggling, rugged and patches of cross-border streams and tunneling activity by Pakistan, examples of some of which are: on September 30, 2017, BSF detected a cross-border tunnel, 14 feet long, three feet high and 2.5 feet wide, in forest area of Damala nullah in Jammu's Arnia sub-sector, designed to facilitate easy infiltration of terrorists – second such tunnel discovered in the Jammu sector during 2017 and the fifth since 2012; four other tunnels discovered were in Ramgarh sub-sector (February 2017), Allah Mai de Kothe, RS Pura Sector (March 2016), Pallanwala sector (August 2014), and Shakkergarh area (July 2012), and; Jammu sector also witnessed instances of successful infiltration by terrorists as prelude to attacks on Pathankot IAF base and Army base at Uri during 2016. Without doubt it merited serious attention, which thankfully came with directive of the Punjab and Haryana High Court. 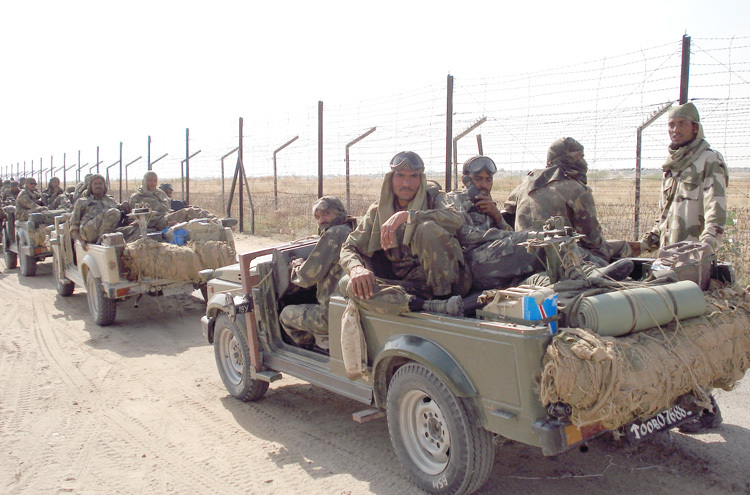 Even without exchange of fire, guarding the 3,600 km Indo-Pak border is complex issue. On March 22, 2016, the BSF issued a request for proposal (RFP) inviting technological solutions for the CIBMS. The two stretches selected for the 22 crore pilot project are because of their difficult terrain with dense growth of elephant grass and interspersed with cross-border streams and dense growth of elephant grass. Significantly, these stretches have been used by Pakistan many times for infiltration, smuggling narcotics and fake Indian currency; A cross-border tunnel had also been discovered in one of the selected stretches. The CIBMS is a robust and integrated system that is capable of addressing the gaps in the present system of border security by seamlessly integrating human resources, weapons, and high-tech surveillance equipment. Command and control centre to which the data will be transmitted in order to apprise senior commanders of real time situational awareness, with the composite picture assisting response. India has put up physical barriers along the 3,006 km India-Pakistan border and work is on to complete a final 120 km stretch to prevent infiltration by terrorists, cattle thieves and drug smugg�lers. However, it is still physically patrolled by BSF who count on a small number of hand-held thermal imagers (HHTIs) to spot intruders. A manpower crunch means troopers work 16 to 18-hour shifts. In recent years, smugglers and terrorists have taken to tunneling to infiltrate. On September 17 2018, Home Minister Rajnath Singh inaugurated installation of the pilot CBIMS project along two six km stretches of the border in Jammu. The twin projects, one developed by Tata Power SED and the other by a Slovakian firm, involve embedding multiple sensors along the border-ground surveillance radars, optic sensors, day and night cameras, HHTIs, unmanned ground sensors and a fibre optic intrusion detection system. These sensors will channel their feeds to monitors in BSF border outposts placed at five km intervals along the border. Once the BIMS is fully implemented, state-of-the-art electronically-scanned ground surveillance radar would scan 180 degrees of the border, detect vehicles at a range of 15 km, and humans five km away. The Unattended Ground Sensor would help detect intruders in undulating terrain. The success of the project will determine how the BSF smartens its fence along the borders with Pakistan and Bangladesh. Optimization of technology is essential to augment and complement the traditional methods of border guarding. They enhance the surveillance and detection capabilities of the border guarding forces but at the same time, it must be remembered that the man behind the machine or technology is equally important. If the man is not monitored and neglected, any fence, regular or smart, can be rendered ineffective at critical moments.